Land acquisition order to setup a 1320 MW coal based thermal power plant in Rampal near Sudarbans, the largest Mangrove Forest of the world and a world heritage site declared by UNSECO, was issued on 27 December 2010. The Joint venture agreement to set up the power plant was signed between Indian company NTPC and Bangladeshi company PDB on 29 January 2012. And the EIA was published on January 2013 in the PDB website for public opinion. That means EIA has been done after selecting and finalizing the site where as the very purpose of any EIA is to select a site among many alternatives and decides whether the project on that site is environmentally viable or not. The experts and various organizations present in a people’s consultation arranged by PDB on April 2013, has already rejected the EIA, the department of environment has not approved the EIA yet but the governments of Bangladesh and India are still continuing the project, currently land filling activities is going on which is being implemented by Bangladesh Diesel Plant(BDP), a subsidiary of Bangladesh Army. So, whatever the actual distance is, the area which was once part of the Sundarbans is still closely linked with the Sundarbans through networks of rivers and canals. So, any environmental degradation of this area caused by the coal power plant will surely spread to the Sundarbans region. That’s why it is utmost important to analyze the potential environmental impact before setting up the 1320 MW large coal based thermal power plant. a) Rice production is 62,353 tons in the entire study area (project and 10 km radius from plant location) and 1285 tons in the project area. b) The amount of non-rice crops is about 140,461 tons in the study area. c) The livestock and poultry population per households in the project and study area has been estimated to comprise of 4 and 3 cattle, 3 and 2 buffaloes, 4 and 4 goats, 1 and 1 sheep, 5 and 5 duck and 7 and 6 chicken respectively. 3. Some scattered mangroves would be removed for jetty construction. 4. Suspended particulate matter to be produced from construction activities will be deposited in the surrounding areas and water bodies including river and will change habitat quality of aquatic and terrestrial ecosystem. 5. During construction phase, solid waste and wastes water discharged to the river would cause water pollution. 6. Navigational activities for transporting construction materials through the Sundarbans and dredging activities would create disturbance to fish migration. During the dredging operation, fish migration would be disturbed within the dredging operation area. 7. Alteration of shrimp farming area (gher) and agricultural land for site establishment will cause loss of feeding ground and nesting habitat of different terrestrial common birds like Dove, Eagle, starling etc. As per the EIA, 142 tons of SO2 and 85 tons of NO2 will be emitted daily from the 1320 MW coal power plant. This will obviously increase the concentration of SO2 and NO2 in the ambient air near Sundarbans region which will destructive for whole the environment of the region. 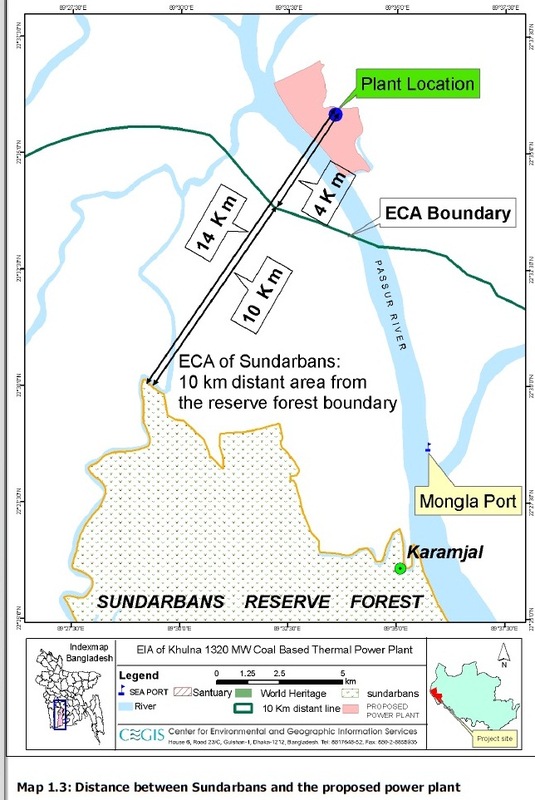 But to show that the emission is well under allowable limit under Environment Conservation Rule 1997(ECR 1997)and thus justify the coal power plant, the EIA has done a trick, it considers the Sundarbans as a ‘residential and rural area’, instead of an ‘ecologically critical area’! In the same way, it claims that although the concentration NO2 would increase threefold, from 16 μg/m3 to 51.2 μg/m3, it is still safely below the limit set by ECR 1997! But can Sundarbans be really considered as a residential and rural area? How and why the Sundarbans, the greatest mangrove forest of the world, a Ramsar Site and UNESCO world heritage site has been considered as a residential and rural area instead of ecologically critical and sensitive area? The reason becomes clear after checking the emission standards of ECR 1997. The emission standards set for ecologically sensitive area is 30 μg/m3 both for SO2 and NO2 which is much below the resultant concentration due to coal power plant. So, if this standard of ecologically sensitive area had been chosen in the EIA, the viability of coal power plant would automatically be proved negative. That’s why the EIA chooses a safer and higher emission standard of ‘residential and rural area’ to justify the coal power plant! And this impact has been observed along the 48 km stretch of Highway 21 where the plant community is just devastated. Huffington post writes: “Along a stretch of Highway 21, in Texas’ pastoral Hill Country, is a vegetative wasteland. Trees are barren, or covered in gray, dying foliage and peeling bark. Fallen, dead limbs litter the ground where pecan growers and ranchers have watched trees die slow, agonizing deaths. If annual emission of 30 thousand tons of SO2 from the Fayette power plant could destroy the vegetation of as far as 48 km, then what might be the impact of 142 tons/day or 52 thousand tons/year of SO2 emission from the Rampal coal based thermal power plant on the vegetation of the mangrove forest Sudarbans which is just 14 km away from the proposed rampal power plant? 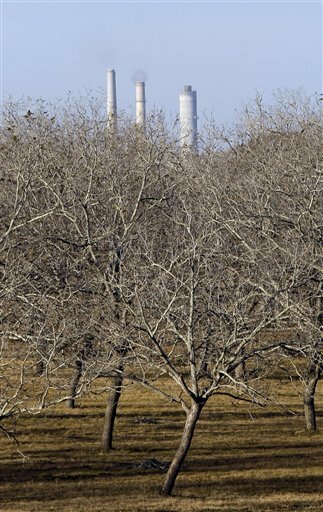 Emission from Fayette coal power plant had destroyed Pecan, elm amd oak trees, but the destruction caused by the SO2 emission from the Rampal power will not be confined to the destruction of some mangrove trees like Sundari, Goran, Geoa, Golpata, it will have a devastating impact on the whole mangrove food web! Mangrove leaf detritus – Bacteria and fungi – Detritus consumers (herbivores and omnivores) – Lower carnivores – Higher carnivores. The chain begins with the production of carbohydrates and carbon by plants through photosynthesis. Leaf litter is then fragmented by the grazing action of amphipods and crabs. 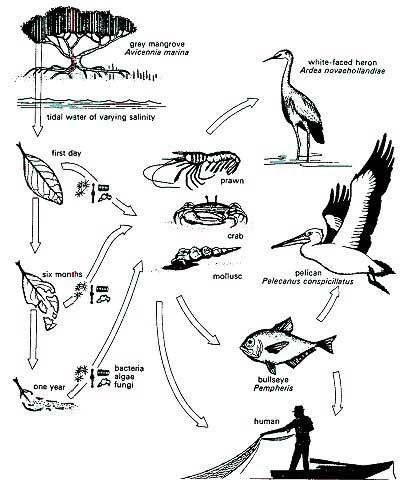 Decomposition continues through microbial and fungal decay of leaf detritus and use and reuse of detrital particles (in the form of faecal material) by a variety of detritivores, beginning with very small sized invertebrates and ending with such species as worms, molluscs, prawns and crabs, who in turn are preyed upon by lower carnivores. The food chain ends with higher carnivores such as large fish, birds of prey, wild cats or man himself. Now, if for example, the leaves of Keora trees are affected due to sulfur injuries caused by emission from the proposed Rampal coal power plant, the impact won’t remained confined just to the Keora trees. As Spotted dears of the Sundarbans depends on the leaves of Keora trees, the impact of sulfur injuries would be transferred to the deer population via the food web which in turns would have impact on Royal Bengal Tigers as well. So, the discharged water from the coal power plant will pollute the water systems of the Sundarbans region due to its changed temperature and velocity, dissolved chemical and other pollutants. Dredging activities will also impact on river water quality. The EIA also acknowledges this: “During dredging operation, water column may be contaminated due to spillage of oil, grease, machine oil, etc. Unplanned dredging may also cause erosion in some places.”(Rampal EIA, page 286). Air effluent of 1250 C temperature will be continuously discharged through the stack of 275 m height of the Rampal Coal based thermal power plant which will increase the local air temperature. But on the other hand there is the plan of dumping the ash on 1414 acres of project land out of 1834 acres to increase it height! Surely, the toxic heavy metals contained in this dumped ash will mixed with rain water and leached in to the ground and contaminated both ground and surface water the impact of which will not be limited to the plant site, rather, spreads through the rivers and cannels of the Sundarbans. Also, the plan for 100% ash utilization in Brick manufacturing, clinker industries, cement industries and also by exporting is flawed and unrealistic as currently the 0.1 million ton of ash produced annually from the far more smaller coal based power plant (220 MW) of Barapukuria cannot be utilized in these way. From 2006 to 2010, 0.26 million ton of ash has been dumped to the ash pond for Barapukuria coal power plant which is causing huge environmental pollution to the surroundings. The proposed 1320 MW Rampal coal power plant also proposes a 100 acre ash pond near the river Passure which will also pollute the air and water of Sudarbans like the Barapukuria region, though in a larger scale. 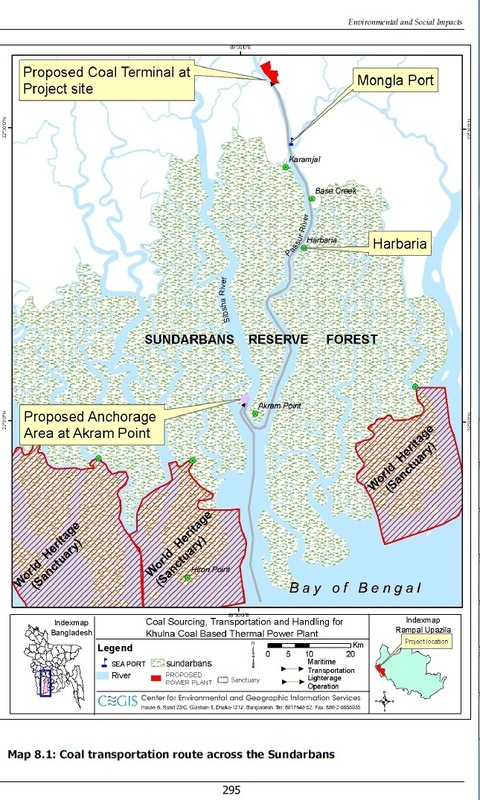 According to the EIA, transportation of coal for Rampal Coal Power Plant from source country (Australia, South Africa or Indonesia) to project site will carried by the river way through the Sundarbans. First, coal will be transported from source country to Akram Point anchorage by using vessels of 80,000 DWT. Then further transshipment by purpose built shallower draught coal carrier of 5000 to10,000 DWT will be done from Akram Point to Mongla Port . A total of 59 voyages will be required each year to transport annual coal requirement of 4.72 million ton by vessel of 80,000 DWT from source to Akram Point anchorage. As per the EIA, five lighter vessels of 10,000 DWT would transship total cargo of a mother vessel by making five voyages within four days. This means larger vessels will ply 30 km distance of the River Passure through Sundarbans from Hiron Point to Akram Point for 59 days a year and lighter vessels will ply 67 km distance of the River Passure through Sundarbans from Akram Point to Mongla Port for 236 days a year. 1.Different types of wastes like the residue of the coal, ballast water, bilge water, oil, lubricant, garbage, domestic waste, food and kitchen waste, slurry of sea water, sewage, etc produced from the Ships will be discharged to the river system and pollute the environment. handling system will create huge sound pollution to the serene environment of the Sundarbans. waste discharge, discharge of ballast and bilge water etc. 4. The coal carrying vessels, plying along the Passur River, will generate wave which will cause shore erosion. 5. Ship-to-ship transfer activities, shipping and barging activities at Akram point will generate noise, discharge coal dust to environment and thus create disturbance to the wildlife of the Sundarbans. 6. Noise generation, beaming of light, etc from shipping and barging activities during night time will create disturbance for nocturnal animals. plants. The excess traffic loads also possesses risk of intrusion of invasive species. The proposed navigation route for coal transportation is also very sensitive as there lies the dolphin sanctuaries which had been officially declared by the Bangladesh Gov on 29th Jan 2012, the very day when it signed contract with NTPC for setting up this coal power plant! So, this poses major risks on the existence of the endangered dolphin species. 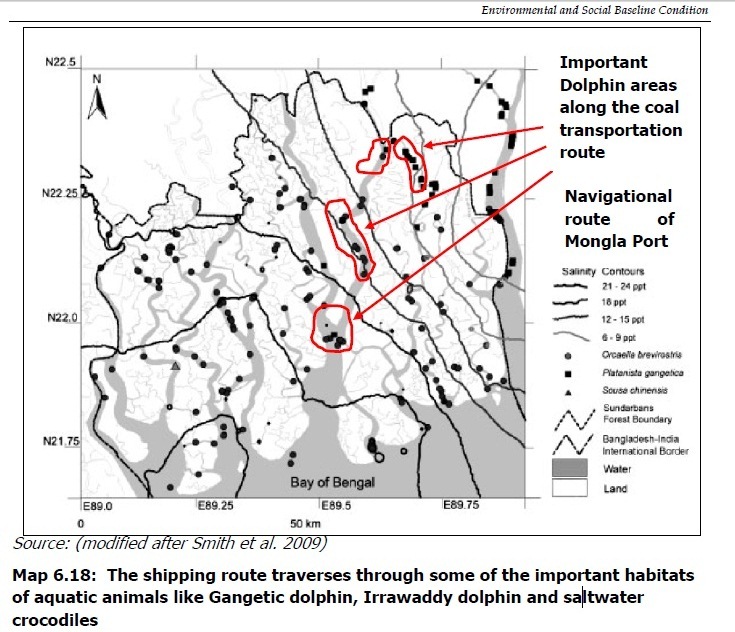 The EIA report also had to acknowledge this risk: “navigation route for approaching Mongla Port to be followed for coal transportation is also important for the critically endangered mammalian species, freshwater dolphins and Irrawaddy dolphins and saltwater crocodiles and an important bird – the masked fin foot”. In an EIA, one cannot just say that “It is very unlikely to form any sulfuric acid mist and the possibility of acid rain is very low.” Acid rain in the surroundings of a reserve forest area is such a dangerous hazard that there is no way to use this kind of words: ‘very unlikely’, ‘very low’. Before deciding to establish a coal based power plant near Sundarbans, one needs to be ensured and 100% certain that there is zero possibilities of these kinds of hazards. 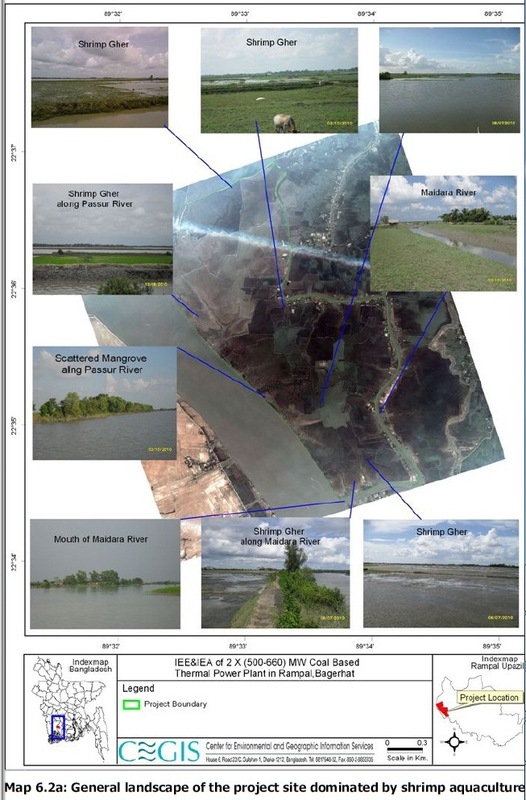 So, it is clear from the above analysis that although the EIA report has tried to justify the Rampal Coal power plant near Sundarbans by using wrong emission standards, under estimating various adverse impacts, not specifying impact in many cases, using words ‘unlikely’, ‘hardly’, ‘very little’, ‘may’, ‘may not’ etc, the impacts of construction & operation of the coal based power plants on the Sundarbans ecosystem documented in the EIA are enough to cancel the project immediately.